This page is about the American medium tank M47. For the version in the Italian tree, see M47 (105/55). The 90 mm Gun Tank M47 Patton II is a Rank V American medium tank with a battle rating of 7.7 (AB/SB) and 7.3 (RB). 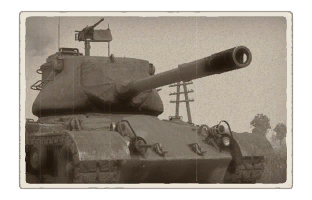 It was introduced in Update 1.45 "Steel Generals" along with the rest of American Ground Forces. 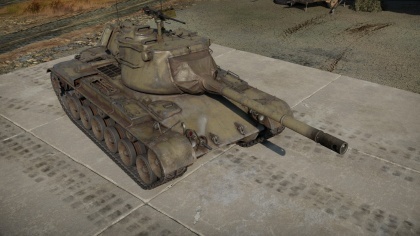 It uses a similar hull as its predecessor, the M46 Patton, but features a new turret and a better gun. Suspension wheels are 20 mm thick, tracks are 30 mm thick. In Rank V, the M47 Patton does not have suitable armour against the numerous 88 mm, 100 mm, and 122 mm calibers running around the field. However, it makes up for that with a potent 90 mm cannon with new ammunition able to fight back. Due to the armour thickness of the Rank V tanks, it is recommended to use the M47 Patton's speed to flank the enemy, then engage them on their sides to detonate their ammo racks or knock out the crew. Ammo racks of the M47 Patton II. Good mobility, same handling as the M46. Great turret traverse speed once upgraded. Decent front armour, more sloped than the M46. 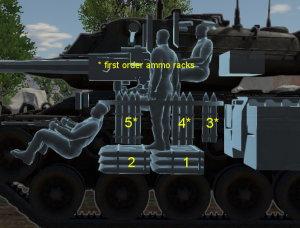 320 mm HEATFS ammunition once unlocked. Worst stock playthrough in the game because the stock ammunition. Overall bad armour for Rank V matches, especially in the turret. The gun is not very good with stock ammo, recommended to unlock HEATFS as soon as possible. Slightly higher than its predecessor. Bad gun depression of -5°. The M47 Patton came about only a few years after its predecessor, the M46 Patton. The basis of this design was the M26 Pershing, which was deemed insufficiently mobile for its role as a medium tank. The M46 was mainly the M26 Pershing with a new engine, transmission, and a redesigned 90 mm gun. While a good solution for the lacking M26 Pershing design, it was only considered a stopgap solution while the experimental T42 medium tank was being developed. However, the Korean War put a stop in that development due to an urgent need of tanks, so the T42 project, which would produce a completely new tank design, was put on-hold. An interim decision was made to mount the turret from the T42 onto the hull of the M46 Patton, this modified tank was designated the M47 Patton and entered production in 1951. A common nickname for the tank was the Patton II, due to the same name as the M46 Patton, this was changed to Patton 47 a few weeks later. The M47 Patton featured most of the armament seen from the M26 Pershing and M46 Patton, with a 90 mm gun and a coaxial and hull-mounted .30 cal machine gun, and a .50 cal machine gun on top of the turret. The M47 Patton has the distinction of being the last American tank with the hull-mounted machine gun on the bow. The new turret required the hull to be redesigned with a larger turret ring and had a "needle-nose" design with the turret mantlet heavily sloped towards the cannon, the design's heavy sloping nature also helped improve protection. The turret also had a large protrusion at the back to act as storage. A M12 stereoscopic range finder was also mounted on a turret, which was difficult to use, but would appear in every American tank design from here on until the M1 Abrams design. Though technically a medium tank by the army standards, a new standardization in US Army tank designation in November 9, 1950 had the entire system changed from the weight of the tank to the caliber of the vehicle's gun. Therefore in 1950s, the "Medium Tank M47 Patton" name was changed to 90 mm Gun Tank M47 Patton. This designation would go on for future American tank designs. The M47 Patton began production in June 1951 before its standardization at the Detroit Tank Arsenal. Delays in the production schedule caused a long period of testing to occur until it was standardized in May 1952. Production ran until November 1953 with a total production number of more than 9,000 M47 Pattons between Detroit and Alco. The M47 Patton came out only a year before the improved M48 Patton. Because of this, the M47 was declared a "limited standard" in American service, and those still in American hands were replaced by the M48 Patton tanks. It was declared obsolete by 1957 and were only retained by infantry divisions until replaced by anti-tank missiles in the 1960s. The M47 Pattons were given out in large numbers to a number of countries in NATO and SEATO, such as Pakistan, Jordan, Turkey, Iran, Croatia, France, West Germany, and Spain. The M47 Pattons would see service in combat in both Indo-Pakistani Wars, the Six Day War, the Iran-Iraq war, the Invasion of Cyprus, and the Croatian War of Independence. Today, they are still being used in Spain as armour recovery vehicles in artillery and infantry units. The M47 Pattons were promising new designs developed from the M46 Pattons to improve its combat capabilities with a newer turret. However, it did not serve much in America due to the M48 Patton development, which was a completely new deign and had nearly no identical parts with its predecessor. It served very well in other countries as their primary armour forces, but those left in the states were used as targets in firing ranges, mainly for training or as tests for future anti-tank developments. In the 1970s, one was tested against the M60 Main Battle Tank, the successor to the M48 Patton, and its 105 mm L7 gun. The HEAT round fired from the gun penetrated the frontal armour of the M47 Patton with relative ease, armour which was considered superb at its time of introduction. The test went on with many M47 tanks and would prove that conventional steel armour in tank warfare was becoming obsolete in the face of new tank ammo. This page was last edited on 28 March 2019, at 17:04.